Again I have been spared by an overruling Providence to pass through another engagement with the enemy of a desperate character, the result of which was a glorious victory of the Confederates, but alas, sad thought, it was accompanied with the killing of two of our company and wounding 18. Sargt Duncan was killed and the ever faithful and Christian solider, D B Paine – my mess mate, and the wounding of Newt Shaw in the shoulder and Charley Gaston, though neither of them are dangerous, Newts was slightly in the shoulder. 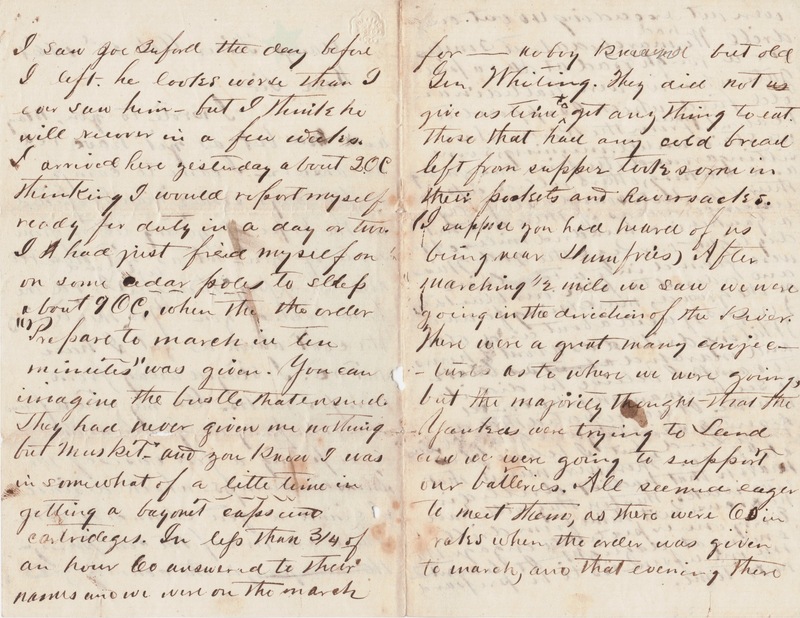 I tried twice to write to you all after we left Staunton but they marched us so fast, that I could not get time to finish it, though I would like to give you the details of our sojourn at Staunton, but the Great Battle before Richmond is now the subject of conversation. Click image of CSA Lieutenant General Thomas Jonathan “Stonewall” Jackson to learn more. Gen Johnson attacked the Yankees in front while Gen Jackson went to their rear. Gen Whitings division joined Jackson at Staunton and from there we took the cars and came with in ten miles of Ashland, and marched there that night where Gen Whiting told us we would draw 3 days rations of beef and crackers and crack crackers coock our beef without utensils and be ready to march at daylight, and that we were going right into the enemy enemies lines. Sure enough we commenced the march in the rear of the evening led by the renowned Stonewall Jackson. Our Division was in front but the Texas Brigade was the advance Guard. After going about 5 miles – we came upon some of the enemy, the Texas scouts capturing several of them, They burned a bridge after them and tried to plant a battery on the other side from us, but we pressed them too close, bringing up our artillery, fired one or two rounds at them, killing two and wounding several, when they put out in Bull Run style, they had also cut trees in the road, but we soon had another one cut out and a bridge made, and kept pushing on. Click image of CSA Lieutenant John Bell Hood to learn more. Late in the evening the Texas Brigade had a skirmish with them, which resulted in their rout again, we were quickly drawn up in line of battle, but the Texans met them again and did not give us a chance. We started much marching and marched slowly along feeling our way, for we were there in the enemys lines, and of course had to go slow. We crept along until about 4 O clock in the evening, (Friday) when we heard the artillery open to our right – and after awhile the rattle of musketing which got faster and heavier. We moved off at quick time. Click image of CSA Lieutenant General Ambrose Powell (A.P.) Hill to learn more. Gen Longstreet Hills Division had opened the ball, We formed a line of battle in an old field. by this time, the enemys Guns Battery began to play on us and at least two miles. It was the third shot I think that blowed a Texans head off and wounded Sargt Goodwin. in three feet of me. We then started and went through a ravine 12 men deep and got into the open field in full view of the enemys battery with was at least a mile and half off, the grape shot, canisters and shell falling thick and fast in our devoted ranks. Two divisions had tried to dislodge the enemy, but failed, when Gen Whiting rode out in front of us and told us to charge the Yankees. We never stopped untill within 30 yds of the enemies first breastwork. There was a branch between us and the first one, which was 8 ft wide, the banks being 6 ft high and perfectly straight. It had The first one was about 20 steps from the branch, made of logs about 4 ft high and the same width at the bottom and placed so closely that it seemed almost impossible for a ball to go through it without an accident, and beside that one they had another about 30 steps further up on the hillside. behind both of which the Yankees were thick as they could be, and where the breastworks were, the bushes and trees were so thick we could not see where the enemy was by the flash of their guns, and up on top of the hill they had 8 pieces of artillery. When we stopped and commenced firing on them, we were in plain open view and exposed to the fire of the Yankees from both redoubts and the Battery. They gave the order to charge again and we darted down the hill with a yell, into the branch and by the time we got over the Yanks started. We fired at them and they fell like pigeons. We climbed the first one and before we got to the next one they were out of it and going at full tilt. They tried to rally at their guns, but it was no use, they had started and had no idea of stopping. They had messed up two pieces and started off with them, but our balls killed enough of the hordes to stop the Guns. We drove them on before us, beyond the batteries at least a mile into the swamp. They never saved a single piece out of the battery that we took. They threw away guns knapsacks haversacks – every thing that would impede their progress. They give our Rgt and 4th Ala the credit of taking 8 peices. The battle extended for 4 miles and we drove them back at all points – taking 30 or 40 pieces of artillery. I hope I may never live to witness such a sight again. Our Lt Col said he wanted some men to help him with the wound wounded, so I went with him and was up all night, waiting on the wounded. untill day light. I hope I may never live to witness such a sight again, men groaning, shivering and weltering in their blood. This is monday and the fight was on Friday and there is are some of our wounded on the field and some have died from want of attention. I will drop this subject for this time. I know in this you will hear more than I can tell you now. I left Rgt yesterday, I have cold from reposun and my bowels are deranged but I think I will be able to join the Rgt in a few days. I will give you a list of the ill and wounded. Jess Hardgrove and Pierce were the only ones that are dangerous and I think they will get well. I will write you again as soon as possible. I took a capt prisoner and had a hole cut in my coat sleeve by a minie ball and I am quite certain I killed the Yankee that did it. He shot at me as I was going over the first breast work. I shot at him as he ran and saw him fall. I must close for want of paper. Give my love to all the family and enquiring friends. Write as soon as possible to your devoted son P.M.B. 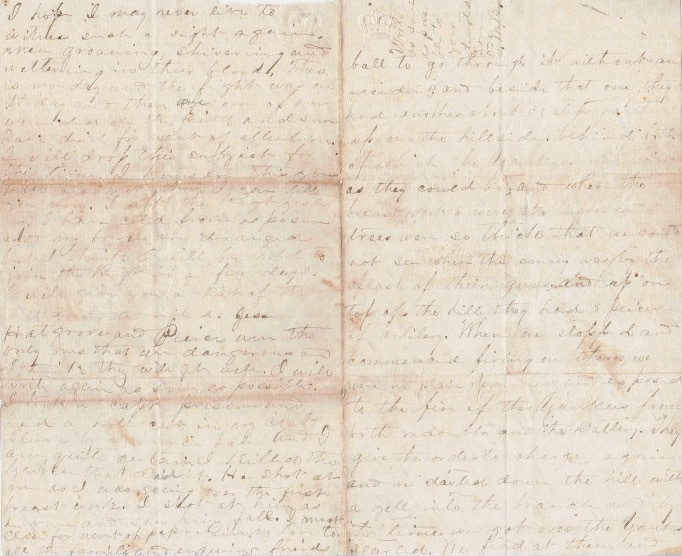 This is the third letter in a row in which Parham began by acknowledging an overruling Providence as the reason he was spared in battle, the previous two describing the Battle of Seven Pines, this one the Battle of Gaines’ Mill. Following the Battle of Seven Pines described in the previous letter, Parham was transported along with the 11th Mississippi by rail car from the Richmond area to Staunton, Virginia to join CSA Major General Stonewall Jackson’s (Shenandoah) Valley Army. Shortly after arrival, the 11th Mississippi began the rapid march back toward Richmond. 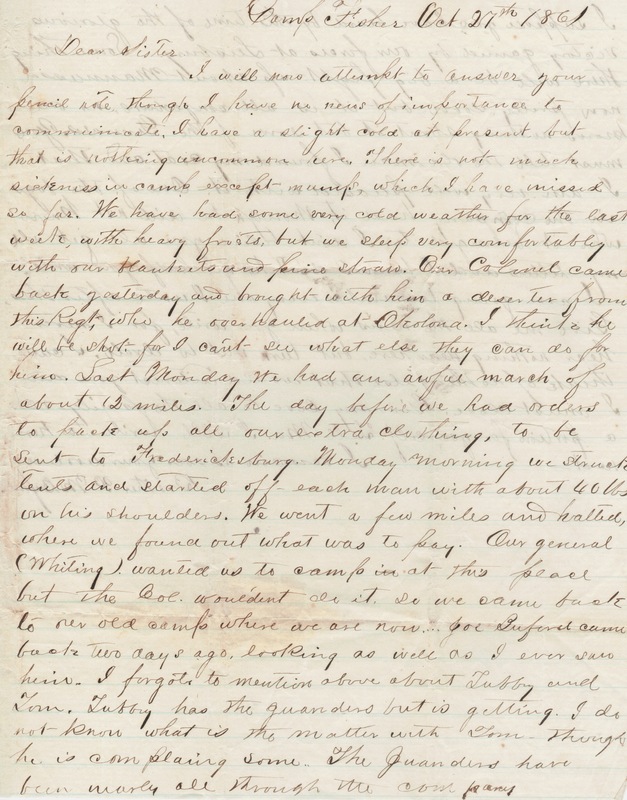 Parham wrote that he tried twice to write to you all after we left Staunton but they marched us so fast, that I could not get time to finish it. Stonewall Jackson had the unique ability to motivate his men to undergo sustained rapid marches, earning them the nom de guerre Jackson’s Foot Cavalry. William G. Duncan was promoted to Corporal August, 1861, and to Fifth Sergeant April 4, 1862. He was killed at Gaines’s Farm. David B. (DB) Paine was during Gaines’s Mill mortally wounded and died at Field Hospital, June 27, 1862…He deserves more than a brief mention when speaking of faithful soldiers. He was most methodical and conscientious in the discharge of every duty called upon to perform, and…that the Confederacy lost a hero who deserves to be held in loving memory in the person of David Brainerd Paine. 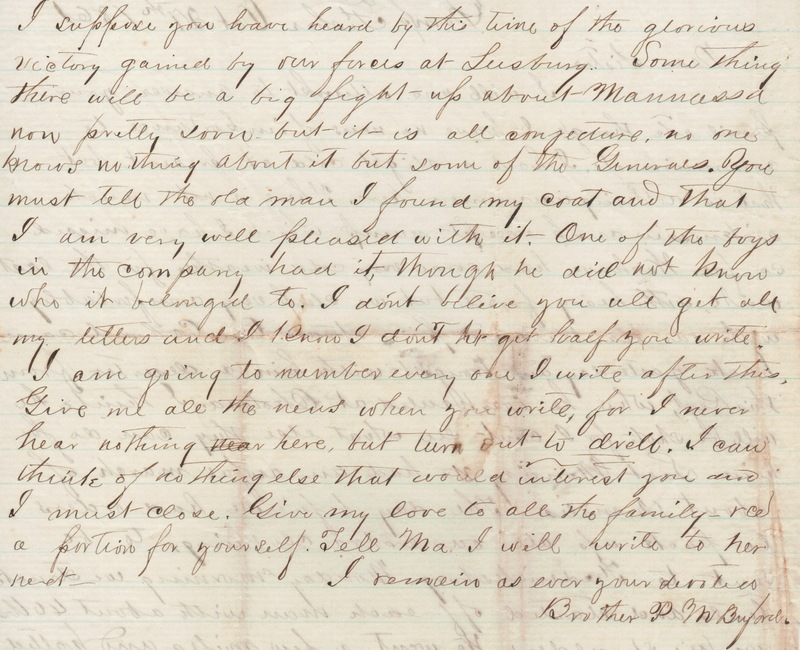 This 21 year old man left quite an impression on survivors of the Lamar Rifles 40 years later and was held in high regard by Parham in this letter. What greater legacy is there for one to leave behind than to be described by comrades as ever faithful in carrying-out duties and Christian? William N. (Newt) Shaw was present at…Gaines’s Farm and was absent wounded until he was present second day at Sharpsburg…at Weldon Railroad, where he was killed on first day. Charles (Charley) Gaston was wounded at Gaines’s Farm…wounded again at Spottsylvania; present at Hanover Junction, and was absent wounded until close of war. Slightly wounded by sharpshooter June 5th, 1864. Jesse (Jess) Hardgrove was present at Seven Pines, Gaines’s Farm, and White Oak Swamp, and died June 29, 1862, from the effects of wound. 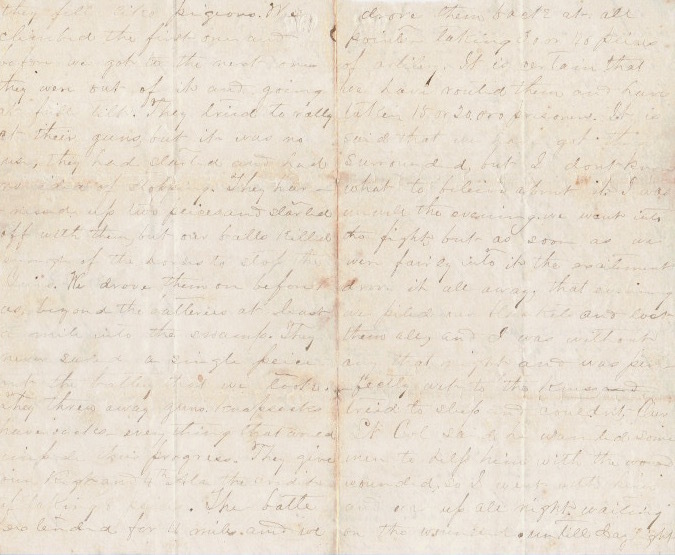 Parham must not have been aware about Hardgrove’s passing at the time of writing the letter the following day. William A. 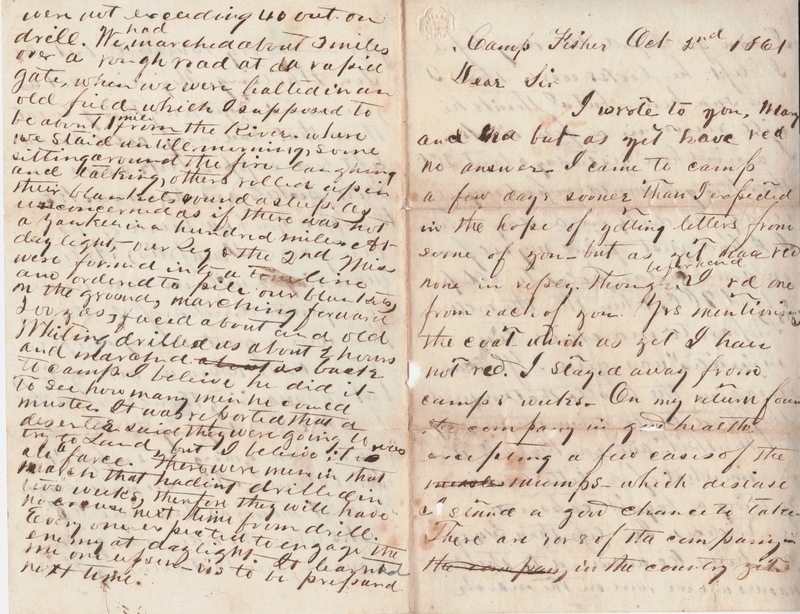 Pierce at Gaines’s Farm was wounded…then wounded at Bethsaida Church. The Texas Brigade Parham wrote about was commanded by CSA Lieutenant General John Bell Hood whom US Army Fort Hood in Killeen, Texas is named after. Parham stated they gave the order to charge again and we darted down the hill with a (Rebel) yell. The Yankee’s retreat which followed was described as Bull Run style, meaning the Union soldiers dropped everything, turned around, and fled at full speed as they had at First Battle of Bull Run (also known as First Battle of Manassas). I will now attempt to answer your pencil note though I have no news of importance to communicate. I have a slight cold at present, but that is nothing uncommon here. There is not much sickness in camp except mumps, which I have missed so far. We have had some very cold weather for the last week, with heavy frosts, but we sleep very comfortably with our blankets and pine straw. Our Colonel came back yesterday and brought with him a deserter from this Regt, who he overhauled at Okolona. I think he will be shot. for I can’t see what else they can do for him. Click image of CSA General William Henry Chase Whiting to learn more. Last Monday We had an awful march of about 12 miles. 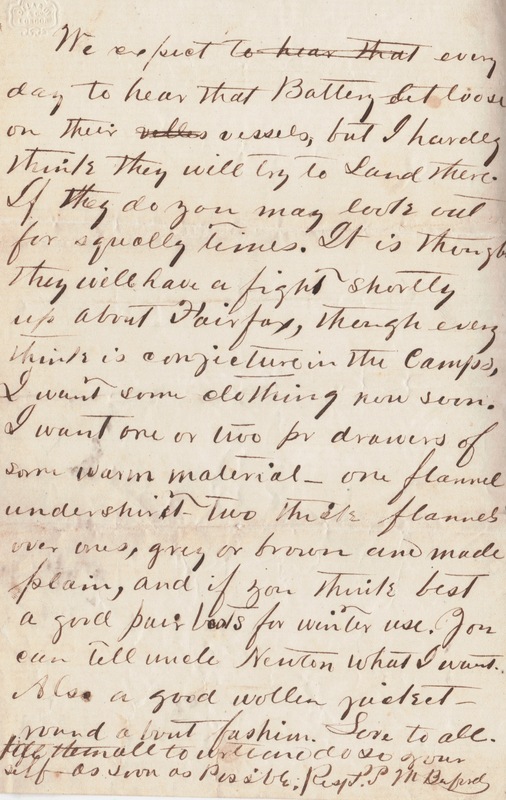 The day before we had orders to pack up all our extra clothing, to be sent to Fredericksburg. Monday morning we struck tents and started off – each man with about 40 lbs on his shoulders. We went a few miles and halted, where we found out what was to pay. Our general (Whiting) wanted us to camp at this place but the Col. wouldn’t do it. So we came back to our old camp where we are now…. Joe Buford came back two days ago, looking as well as I ever saw him. I forgot to mention about about Tubby and Tom. Tubby has the guanders but is getting. I do not know what is the matter with Tom – though he is complaining some.. The Juanders have been nearly all through the company. I suppose you have heard by this time of the glorious victory gained by our forces at Leesburg. Some thing there will be a big fight, up about Mannassa now pretty soon but it all conjecture, no one knows nothing about it but some of the Generals. You must tell the old man I found my coat and that I am very well pleased with it. One of the boys in the company had it, though he did not know who it belonged to. 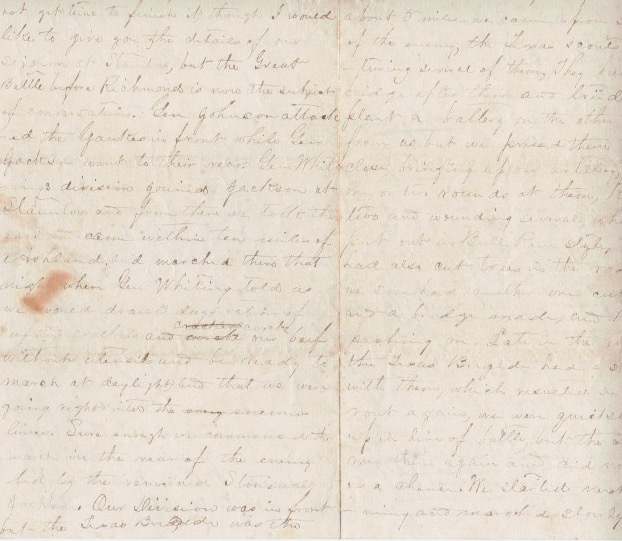 I don’t believe you will get all my letters and I know I don’t get half you write. I am going to number every one I write after this. Give me all the news when you write, for I never hear nothing here, but turn out to drill. I can think of nothing else that would interest you and I must close. Give my love to all the family, rcd a portion for yourself. Tell Ma I will write her next. Painting is “Decision at the Crossroads – The Battle of Corinth” by Keith Rocco. Click image to view virtual gallery and studio of Keith Rocco. The Colonel that brought with him a deserter…who he overhauled at Okolona is Colonel William Hudson Moore. Colonel Moore is returning after recovering from an accidental shot to the foot during the Battle of First Manassas and eventually returns home again. He later commands the 43rd Mississippi and is killed at Corinth, Mississippi while defending against Yankee invaders. Painting above by Keith Rocco may be showing Colonel Moore upon a horse in battle moments before his death. Tubby is Goodloe Warren Buford, Jr.
Parham is referring to jaundice when writing of guanders and juanders. As I have an opportunity of sending a letter by Mr. Wilkins. I thought I would take advantage of it and send you a few lines. It has been at least three weeks since I rcd a letter from any of you. I can not see why it is that I do not get your letters for I am fool enough to believe that you all write oftener than that. Mr. Paine is the only that rcs letters from the Hill with any thing like Regularity. As usual I have nothing of interest to write. I was quite sick two days last week with cold and fever. I took a dose of Antibilious pills which set me all right. I am now in fine health and doing fine in all respects with the exception of our eatables- which are few and far between, though we get things from Huxsters sometimes- which helps out considerably- but we have have to pay double price for almost everything we get. Our Regt went down to the batteries one evening last week and lay on the ground all night + went back next morning. + and I think it probable we will have to go back in a few days. Gen Whiting gave orders that if any civilian was caught selling whiskey in this Brigade to tie him up and give him 39 lashes with a Waggon whip well laid on. I know it is not generally the case to run down a company or Regt in ones own Brigade- But there is one Reg in ours that bears off the palm vis- the 1st Tennessee. I have no doubt but they will do good fighting- but they are a rough set certain. Some of the them to my certain knowledge has sold whiskey in this Reg for 11$ per quart. and I think they ought to have about 40. I would like to know when I will get my clothes. You must be certain to send a blanket or two if you can get them. and I don’t reckon a pr good brown pants would go amiss- for one pair that I started with are literally no account. the pr like my coat. My overcoat is the very thing for cold and rainy weather. Give my best respects to all the family. Tell Ma I will write to her next and Mary Jane to answer my letter as soon as possible. Write soon yours. 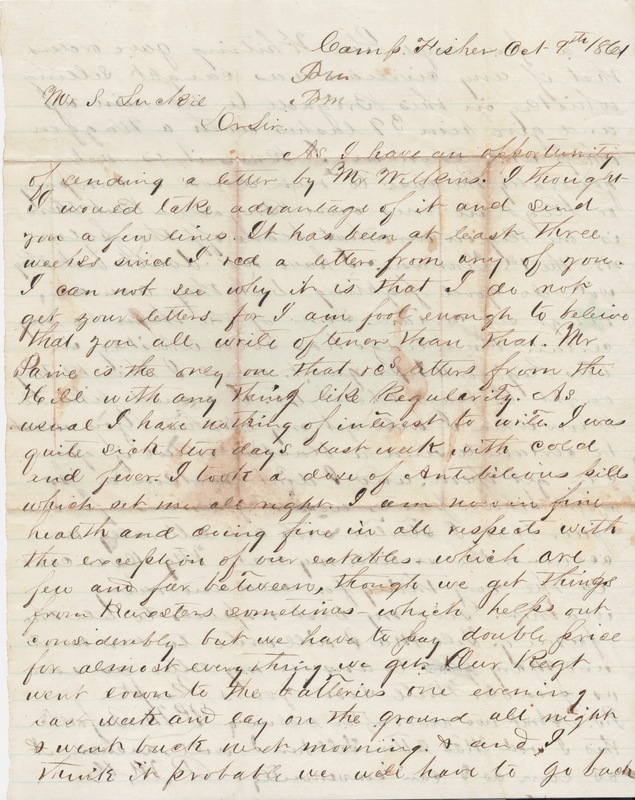 It appears Mr. Wilkins hand-carried this letter to Parham’s family. Who is Mr. Wilkins? 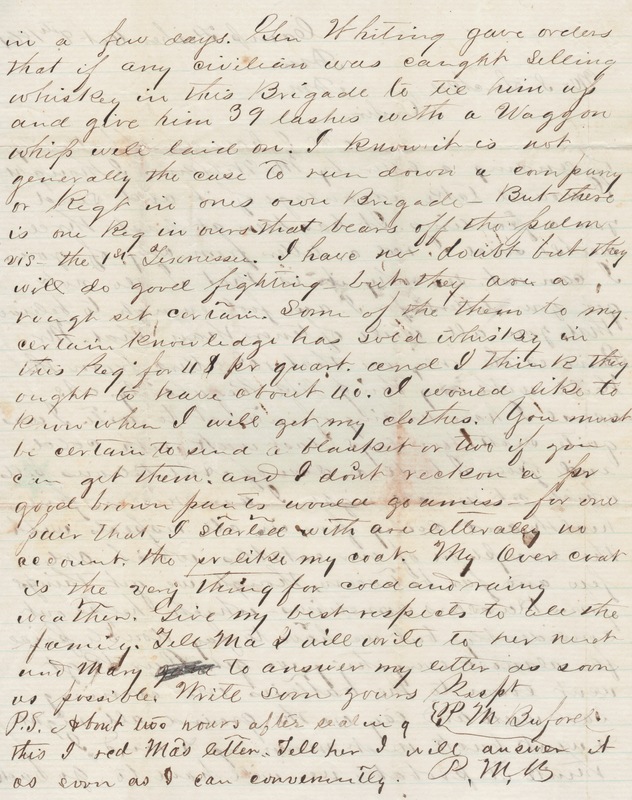 Parham serves in the “Lamar Rifles” with Newton B. Wilkins, occasionally referring to him in letters as Newt. Mr. Wilkins was possibly Newt himself who, according to Lamar Rifles: A History of Company G, Eleventh Mississippi Regiment, C.S.A., enlisted at age twenty-three while single and a clerk at Oxford, Mississippi; was severely wounded on the last day of Gettysburg; and died in Richmond in August of 1863 from effects of wound in right shoulder. Newt should not be confused with Walter Buford’s father, whom Parham calls Uncle Newton or Uncle Newt. 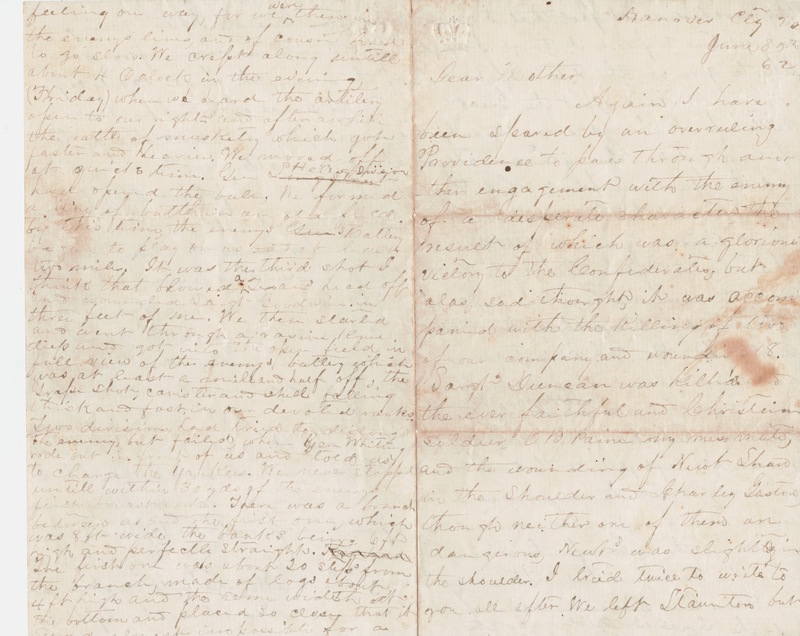 Parham indicated Mr. Paine is the only that rcs letters from the Hill with any thing like Regularity. Mr. Paine was possibly David B. Paine who, according to the before mentioned reference, enlisted at age twenty-one while single and a student at College Hill, Mississippi; was mortally wounded at Battle of Gaines’s Mill; and died at a field hospital on June 27, 1862. I wrote to you, Mary and Ma but as yet have rcd no answer. I came to camp a few days sooner than I expected in the hope of getting letters from some of you- but as yet have received none in reply. Though beforehand I rd one from each of you. Yrs mentioning the coat which as yet I have not rcd. I stayed away from camp 3 (?) weeks. On my return from the company in good health excepting a few cases of the mumps- which disease I stand a good chance to take. There are 7 or 8 of the company the company [crossed-out in ink] in the country yet I saw Joe Buford the day before I left. He looks worse than I ever saw him- but I think he will recover in a few weeks. I arrived here yesterday about 2OC thinking I would report myself ready for duty in a day or two. I had just fried (?) myself on some cedar poles to sleep about 9OC, when the the [sic] order “Prepare to march in ten minutes” was given. You can imagine the bustle that ensued. They have never given me nothing but musket and you know I was somewhat a little in time in getting a bayonet caps and cartridges [sic]. In lefs [sic] than 3/4 of an hour 60 answered to their names and we were on the march for _____ nobody knowd [corrected over in pencil with “knew”] but old Gen Whiting. They did not give us time to get anything to eat. Those that had any old bread left from supper took some in their pockets and haversacks. (I suppose you had heard of us being near Dumfries). After marching 1/2 mile we saw we were going in the direction of the River. There were a great many conjectures as to where we were going, but the majority thought that the Yankees were trying to land and we were going to support our batteries. All seemed eager to meet them, as they were 60 in raks [sic] when the order was given to march, and that evening there were not exceeding 40 out on drill. We had marched about 3 miles over a rough road at a rapid gate, when we were halted in an old field- which I supposed to be about 1 mile from the River. where we staid [sic] until morning, some sitting around the fire laughing and talking, others rolled up in their blankets sound asleep. As unconcerned as if there was not a Yankee in a hundred miles. At daylight, our Reg and the 2nd Miss were formed into a timeline [“time” smudged] and ordered to pile our blankets, on the ground, marching forward 200 yds, faced about and old Whiting drilled us about 2 hours and marched us back to camp. I believe he did it to see how many men he could muster. It was reported that a deserter said they were going to try to land, but I believe it was all a farce. There were men in that march that hadn’t drilled in two weeks, therefore they will have no excuse next time from drill. Everyone expected to engage the enemy at daylight. It learnt [marked over with pencil as “learned”] me one lefsen [sic]-vis to be prepared next time. We expect to hear that [crossed-out in ink] every day to hear that Battery set loose on their velles [crossed-out in ink] vessels, but I hardly think they will try to land there. If they do you may look out for squally times. It is thought they will have a fight shortly up about Fairfax, though every think [sic] is conjecture in the camps. I want some clothing new [sic] soon. I want one or two pr drawers of some warm material- one flannel undershirt- two thick flannel over ones- grey or brown and made plain- and if you think best a good pair of boots for winter use. You can tell Uncle Newton what I want. Also a good woolen jacket- round about fashion.